​We are proud to be the recipient of the Tribune Star’s Best Pharmacy award in 2011, 2013 and again in 2014! We feel that this award shows that our customers recognize the outstanding level of service that we strive for with each and every customer. Looking for an easy way to manage your medications and make sure you don't miss a dose? Do you have a parent that needs help remembering to take their medication? Our custom pill dispensing program is the answer for you. For a small fee our staff will package all of your medication in a DISPILL blister pack. Each dose will be packaged in a personalized, detachable and color coded blister pack. This blister pack not only makes it easier to take your medication, it also helps you if you can't remember whether or not you have taken your medication. 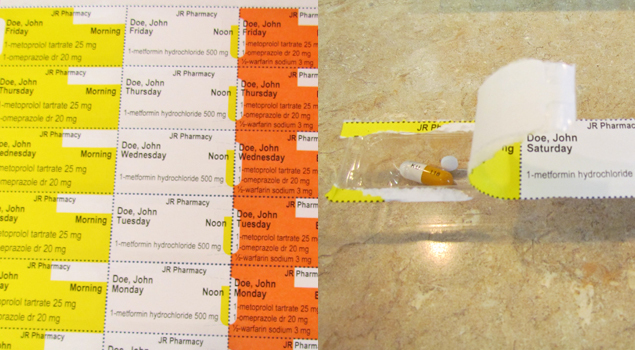 The blister packs come with a full week of medication divided up into four different doses per day. And after you are done with the week, simply throw it away. No more dirty pill reminders. For you convenience, if you are going to be gone for a day or two, you simply have to tear off the appropriate number of days of medication and take them with you. It is simply that easy. Stop by or call one of our locations for details and find out how beneficial this service can be to you! ​JR Pharmacy also offers delivery services for those people that can't get out or need some assistance. Prescription delivery is available Monday through Friday from all four of our locations. Simply phone in your order by noon and you will receive your prescription the same day. If the order is placed after noon, you will receive it on our next delivery day.